Frame and embellish your photos in one simple step with the Fall Snapshots Embellishment Mini - Frames! Create beautiful layouts of fall and photography with the Fall Snapshots collection Biggie! Six Simply Vintage stamps are provided in png and abr format. A set of 9 vintage ephemera brushes in both .png and .abr format. Perfect for creating vintage paper backgrounds. 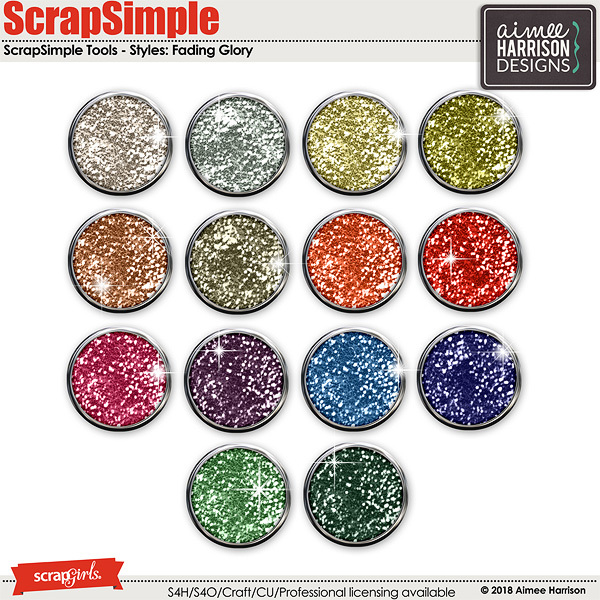 Sweet Summer Treats Glitters by Aimee Harrison are CU4U/CU/PU/S2H/S4O friendly. A collection of six (6) collaged transfer elements featuring watercolor splashes and golden antique autumn leaf botanical images. Perfect for use in your art journaling projects as well as everyday scrapbooking layouts.